Honolulu steps up again and joins in the global charity event called Twestival which uses social media to bring together people in support of global good. 2009 marked the first year of Twestival Global and Honolulu kicked it off with an amazing turnout in support of Charity Water. 2010 took us into year two of Twestival Global in which Honolulu aided in providing much needed funds for Concern Worldwide who was also one of the first on the ground in Haiti after the earthquake that took place in early 2010. This year, the third year of Twestival, allows for each Twestival city to pick a local charity to benefit from social media for local good. The Honolulu team has come together once again to bring you an enjoyable social gathering to bring aid to this year’s charity, a local charity, which is the Blood Bank of Hawaii, a lifesaving non-profit organization that provides blood products to 11 civilian hospitals on Oahu and eight civilian hospitals on the neighbor islands. This year’s Twestival will take place at The Venue, one of the hottest live music spots during First Friday, only on a Thursday. And the lineup features beatbox and dance performer Jason Tom, renown dancer and singer Willow Chang, musician and producer Kamuela Kahoano (son of Kimo Kahoano), and singer songwriter Emi Hart. There will also be complimentary pupus, free swag, and prize giveaways. Ticket sales are the primary fundraising channel for Twestival, with one hundred percent of monies going to charity. Once again, tickets for Honolulu Twestival are available online for $20 in advance, or $25 at the door. The event is made possible through the support of sponsors, like Farmers Insurance Hawaii and Hawaii Aloha Travel, and a team of dedicated volunteers. Honolulu Twestival organizers join the world in expressing support for the victims of the devastating earthquake and tsunami in Japan that occurred on March 11th, 2011, and attendees will be encouraged to make special donations to the Hawaii Red Cross. But while the global community holds its breath watching the crisis unfold overseas, the need to sustain the local blood supply never subsides. If you’d like to help out and volunteer with Honolulu Twestival you can join in the conversation or send a blank email to: hitwestival@googlegroups.com and receive updates direct in your inbox. We are still seeking sponsors and individuals who can help obtain sponsors, special giveaways and also volunteers who can help at the event with setup and other tasks throughout the night. For more information please contact organizer Ryan Ozawa or music coordinator Jason Tom. This years event is on the evening of Thursday, March 24th at The Venue in Chinatown. Let’s all come together for our local charity, the Blood Bank of Hawaii, and show support for this life saving agency who continues to help so many. 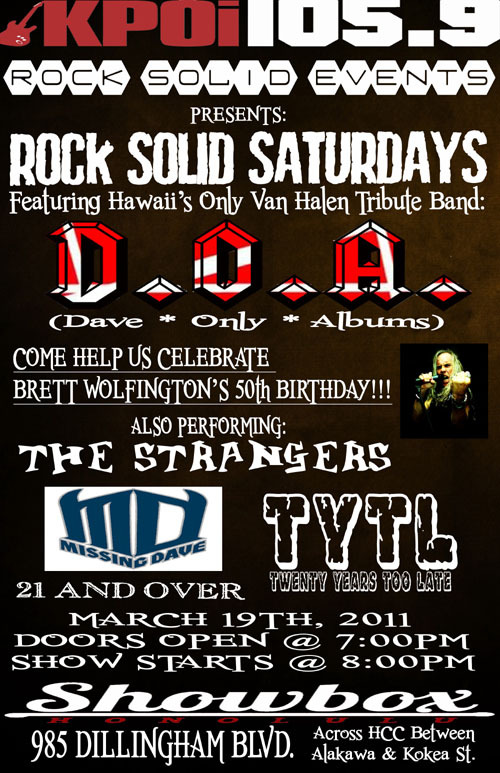 A night with Hawaii’s only Van Halen Tribute Band (D.O.A. Dave Only Albums) as they perform at the new venue Showbox Honolulu. What a rockin’ night at an awesome new venue in which D.O.A. lead singer Brett Wolfington also celebrated his 50th birthday with the fans. Mahalo to Brett for inviting 808Talk Hawaii to join in the celebration! If you get a chance be sure and check out D.O.A. and party hard to some awesome rock ‘n’ roll in the Aloha State! Rock Solid Saturdays at Showbox Honolulu, Oahu’s newest Killer venue for Live Music! Located at 985 Dillingham Blvd. across from Honolulu Community College same building as GBC Boxes. 70 stall parking is available with additional parking 1 block away. A very clean large open area inside with State of the Art sound and lighting. Plenty of seating and tables, full large bar and mezzanine VIP lounge. No food available but you may bring in your own favorite Pupu’s or Plates. $10 cover, tickets available at the door, 21 and over! Showbox Honolulu is also available for Fund Raisers or Special Events! Joshua Alo – “Orchid Unknown” Officially Released! We are pleased to announce the release of our good friend Joshua Alo’s second album titled “Orchid Unknown.” Joshua has been a long time friend here at 808Talk and has been featured several times over the past few years on our podcast. Most recently we were able to sit down and talk about who “Joshua Alo” (YouTube Video) really is and get a small glimpse into his life and music and what has made him who he is today. Please visit Joshua on iTunes and purchase his new album “Orchid Unknown” today! This is Joshua Alo, Hawaiian Roots Reggae Artist. I am overjoyed to personally announce that my 2nd album “Orchid Unknown” is now officially released and is available on joshuaalo.com & iTunes after 2 1/2 years of trials and struggles. But in the end there was wisdom, faith and patience to be gained so every penny, second & effort was well worth it. I truly hope that you enjoy the album as much as I have enjoyed making it. Mahalo Nui Loa! Please share the news. Thank you so much for your support. SOUL­JA BOY took the stage in Hon­olu­lu, Hawaii to cel­e­brate his new al­bum in stores now called “The De­an­dre Way.” Dance en­thu­si­asts straight from the World of Dance Tour en­joyed the set which in­clud­ed new songs “Blow­ing Me Kiss­es” and “Speak­ers Go­ing Ham­mer” mixed with pop­u­lar hits “Turn My Swag On”, “Crank That” and “Pret­ty Boy Swag.” Watch the show here and share it with your friends! Soul­ja Boy’s new mu­sic is fea­tured in the lat­est Dance Cen­tral video game out now by Har­monix and MTV Games. A great pre­sent for kids along­side the new Xbox Kinect con­sole. Hawaii’s own Jake Shimabukuro is back home in Honolulu this week for three performances for the Honolulu Marathon. We talked to Jake after he played a set at the Marathon Expo. Listen in as Jake talks about growing up in Hawaii and his new CD “Peace Love Ukulele”. Jake’s new album, “Peace Love Ukulele” debuts in January with a CD release party at DFS Galleria in Waikiki. April M. Williams is a frequent visitor to Hawaii and a great friend of 808Talk. She is also the author of the book “Social Networking Throughout Your Career”, available in paperback and on the Kindle. Justin Bieber, quite possibly one of the biggest teen sensations ever – just wrapped up the Hawaii leg of his “My World Tour” in which he sent out a big “thank you” to the fans and people of Hawaii. He then went on to say in a tweet “im really gonna miss Hawaii. it is awesome here. but Japan…im not complaining…haha. See u guys soon” and with that we say Aloha to Justin Bieber and watch out Japan because here he comes! During Justin Bieber’s stay in Hawaii he managed to get out and do some great things it appears as indicated through his tweets while in the islands…including recording a new song that he said might be good to put it out for the Holidays & raise some money for charity…he also was accompanied by Jasmine Villegas and Jaden Smith during his Hawaii visit. Im thinking sunshine, beaches, surfing…Im thinkin HAWAII!! like i said…i really really like it here. Hawaii great night and great vacation here. me, jaden, and @JASMINEVILLEGAS all had a great time. thank u. cant wait to come back! !